From the Pen of Br. Bob Chiulli, O.Carm. 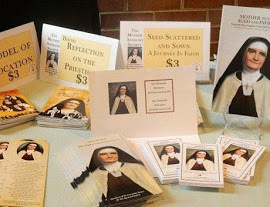 The Commission for the Cause and Charism (CCC) of Venerable Mary Angeline Teresa had their meeting at the National Shrine of Our Lady of Mount Carmel in Middletown, New York last September 17, 2016 to continue the work of advancing the Cause in Rome. Moments of Mission: Early Life of Venerable Mary Angeline Teresa McCrory from Carmelite Sister on Vimeo.